Comments: Comment from George Carroll: This is a picture of my uncle Walt Taitt's 37 Ford Sportsman car, from National Park NJ. This car won 3 Sportsman championships at Vineland speedway with Steve Elias at the wheel. The photo was taken around 1964 by my cousin Walt Taitt Jr. Feel free to use it on the web site. 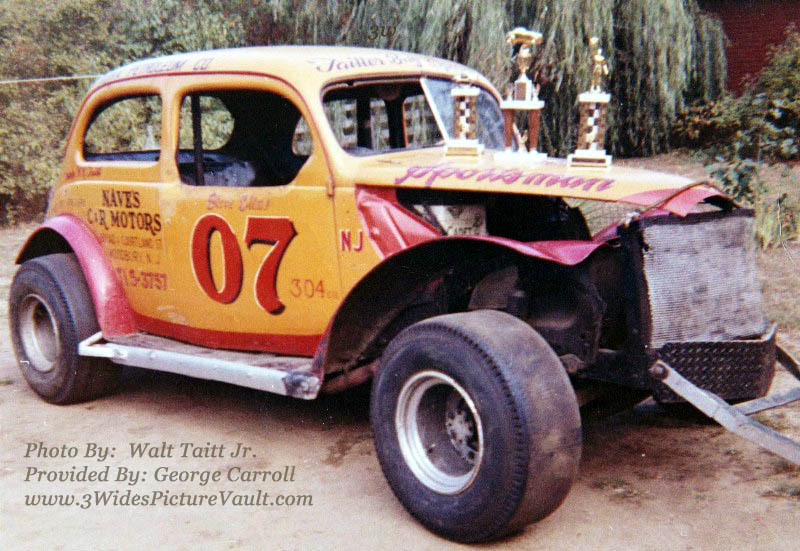 So cool to see the Walt Taitt 07 that Steve Elias drove this picture was taken before I got to go to my first race. But around 1971 I stumbled on Walt's Shop in National Park. I was a young kid at the time and he was racing at Flemington then. He was so kind and talked to me and my buddy about the car and what it was like. I bugged my dad to take me to the races he finally did. After Bridgeport was open we would see his coupe and the Camaro that followed race. He did not have much success but we always were pulling for his car. I remember one night the 07 went out of the track in turn 3. I would love to see pictures of the other cars he had. Good childhood memories.